I love Canon printers, they have always delivered amazing print-outs at superfast speeds and their tanks have always been great value (the “start” time has never been great, but I can live with that!). My first Canon printer cost me over £300 and just because it was a “photo quality” printer with separate cartridges (that I could drill into and re-ink with a syringe and a blob of hot-melt to seal). A refund later, a re-order and a final packing up of damaged printer and its all good again. But what did get me thinking is the price tag of the printer…. £50, with ink! at that price the concerns of third part ink vanish. Why? well at £50 for a new set of ink I might as well but 3rd party inks for next to nothing, in fact 2 sets for about a £1 a cartridge, just over £10. The printer can break anytime it likes (as long as I get to use my two sets of 3rd part ink and I am quids in!). I would still buy Canon everytime! Simply put it is a case of turning on your Personal Hotspot and once your surface picks up your phones name input the password that is set, the problem is this will cost myself £5/Gb. Not something that I want to worry about. Connecting via wire/USB is not an option as you cannot install the drivers required on the Surface RT but you can by Bluetooth….. 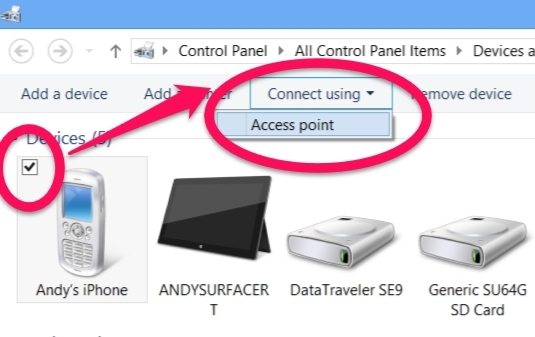 Select “Connect Using” and then click on drop down menu and Select Access Point. I have found this is sufficient for reasonable access. Don’t expect it to be consistent/stable. Today I had the opportunity to wireless present in the classroom (something I feel has been lacking on the Surface RT). Admittedly it is not a direct connection (such a Miracast) but a workaround using RDA (Remote Desktop Assistance) to the PC attached to the Interactive Board (mentioned in a previous post). There is slight lag, due to the network, but it is excellent none-the-less and I hope to test it on a better part of our WiFi network tomorrow. A number of presentations were tried with differing success, more on this in a later post, however animated sequences such as those with Prezi do not do any presentation justice. But to wander around the room whilst presenting is something I am really eager to try! The last day of the North American Trip has been reached and I am amazed at how prevalent WiFi is around the North America, Not only do we have WiFi at the Airport, but also on the Ferry back from Victoria to Vancouver and also the coach that we drove on and off the ferry in. In fact WiFi is so openly available that I have not had use my phone once to communicate with other than jumping on internet systems such as Facebook or Skype (which in all cases fared better on the Surface RT). An extremely busy day in Vancouver yesterday with a visit to BCcampus which is a publicly funded organization that uses information technology to connect the expertise, programs, and resources of all B.C. post-secondary institutions under a collaborative service delivery framework. We provide valued services to institutions, ensuring B.C. learners, educators, and administrators get the best, most effective technologies and services for their learning and teaching needs. We provide an ICT infrastructure for student data exchange, shared services, online learning and distance education, communities of practice and online resources for educators. Followed by a visit with Vancouver Community College which is refreshingly similar to a UK FE educational establishments, in that they services the community as their primary focus (don’t we all) win teaching staff having gone through teacher training and delivering approximately 25hrs a week, inn stark contrast with Washington State that has 15 hers teaching face-to-fate with no requirement to have teacher training (although the insistence of a Degree). Both organisations offered Eduroam (see an earlier post) that allowed for the Surface RT to jumps on the internet, again the iPhone constantly jumped on and off this network, so I am convinced that given the two devices that the Surface RT would definitely be my device of choice to jump on the net. This week I got an opportunity to quickly try out the Eduroam network( https://www.eduroam.org/ ), whilst this did not provide any obvious benefits within my current organisation I realised that it was a great alternative in the deadspot that I was in whilst trying to pick up our normal open network. On looking deeper into the Eduroam system it became apparent that it is a great system if you are likely to move not only between campuses but also other organisations that have taken up the Eduroam network, effectively an international network of some 5,500 connections. 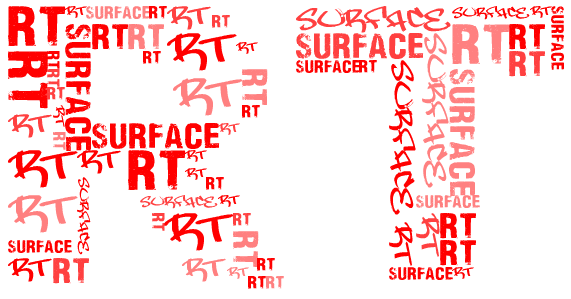 I thought I would quickly revisit the connection to and from the Surface RT a few posts ago, particularly in relation to the Remote Desktop App, to wrap the topic up nicely. The Remote Desktop App does require another PC with a version of windows that allows remote connection…..